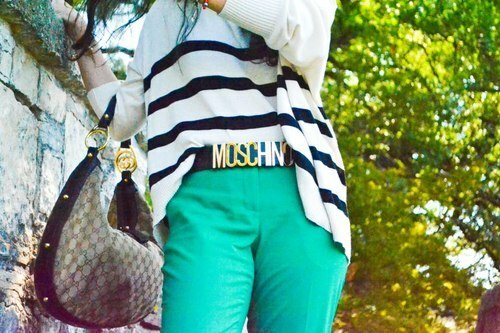 The Italian fashion haus, Moschino, began in the 80s and has steadily climbed the ranks as one of my favorite accessory designers. While the brand obviously carries more than just this fabulous belt (pictured above), the iconic waist-statement completely does it for me. One bright Texas day, I decided to cultivate art at the Dallas Arboretum for the Chihuly exhibit. What to wear? While it seems this is always the question, this outing was exceptionally tricky. I wanted something really cool and comfortable. 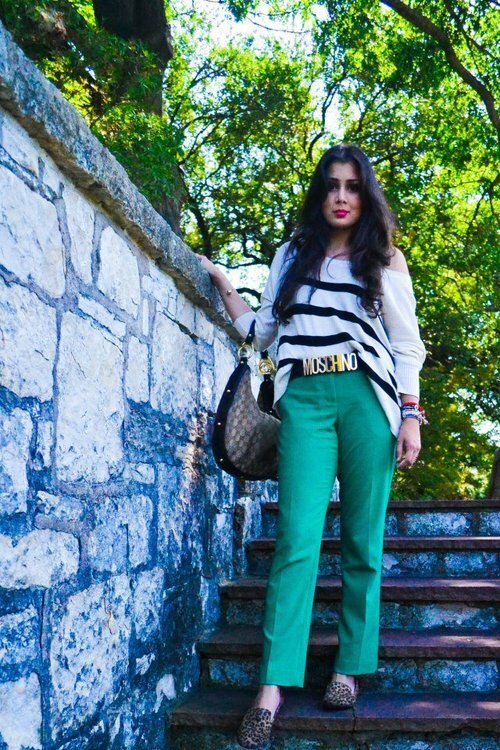 I paired my MINK PINK cropped striped sweater with Vince Camuto green slacks, a black Moschino belt, and Forever 21 leopard flats. I think the best part about this casual-ish outfit is the comfort element. I desperately wanted to be comfy, but not Nike-shorts-sloppy, ya feel me? There’s some luxury brands, some inexpensive brands, a bit of color, mixed patterns, and of course how can I forget about the details? Disregarding my baby hands, I sported a few interesting baubles. Starting from the far left of the photo, I began with a two-finger chained ring from Urban Outfitters, stacked with a spiked dull gold ring from Forever 21, a snake nail tip ring from eBay, and finally, a hinged ring from H&M.